Last weekend, the Pend Oreille Pedalers (POP) Bicycle Club hosted a Trail Work Day at the Mineral Point/Lost Lake Trail System. 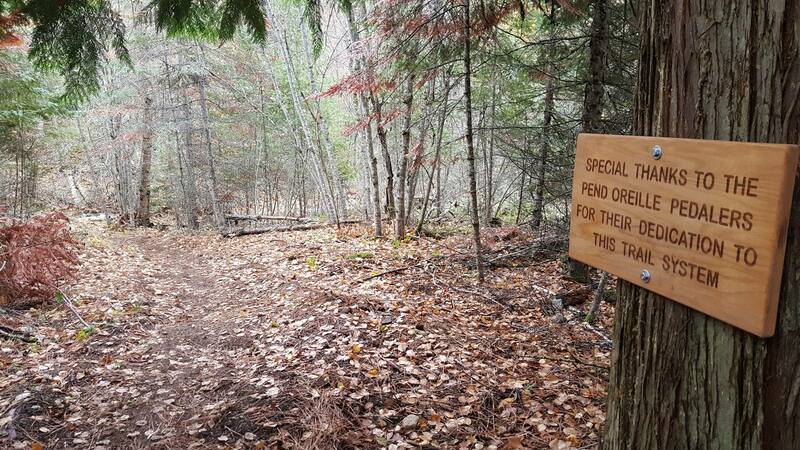 Over 20 volunteers from POP and the Run 7B Trail Runners Club, in cooperation with the US Forest Service- Sandpoint Ranger District, met to help set a new portion of trail. A commemorative plaque thanking POP for their trail work on Lost Lake Trail System. 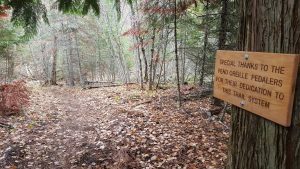 The .6+ mile section was approved, surveyed and cut out by a USFS crew to provide a connector between the end of the Mud Lake/Lost Lake trail and the Mineral Point/Green Bay trail # 82. The additional portion of trail allows riders, hikers, and runners to make a full circle back to the Mineral Point Picnic Area without having to travel on the road. “Now we can do a loop on sweet single track with no road riding!” said Jim Mellen, POP President Emeritus. Trail # 82 is considered one of the most beautiful trails on the Sandpoint Ranger District and is popular with hikers and mountain bikers. Gentle grades, wildflowers and excellent views make this trail suitable for the entire family. The Pedalers Bicycle Club have been instrumental in building and maintaining the nearly 12 miles of trail from Green Bay to Mineral Point and the Lost Lake/Mud Lake loops. The trail is dedicated to the memory of Brent “Jake” Jacobson who gave his life in the line of duty as a Forest Service law enforcement officer. The Pend Oreille Pedalers would like to thank the US Forest Service – Sandpoint Ranger District, as well as all of the club officers, members and volunteers. Thank you also to the members of the Run 7B Club, and to the trail users and stewards who use these trails responsibly. To learn more about the Pend Oreille Pedalers, please go to www.PendOreillePedalers.com or find them on Facebook. "The clock ran out on Dixon’s bills after the legislative session adjourned April 11, leaving the issue dead for the time being. Based on all the feedback I’ve received on this issue, I thought it would be informative to have a conversation with Rep. Dixon to see what’s behind his unflagging effort to toughen up signature requirements for Idaho ballot initiatives." A Montana District Court judge revoked a state water use permit for the proposed Rock Creek Mine this week in a decision conservationists are hailing as a victory. The latest development in a decades-long battle over the proposed mine, the decision puts yet another roadblock in front of the project. Check it all out at sandpointreader.com under "Reader in Print."